Are you looking for an easy way to search for specific documents and PDF ebooks? 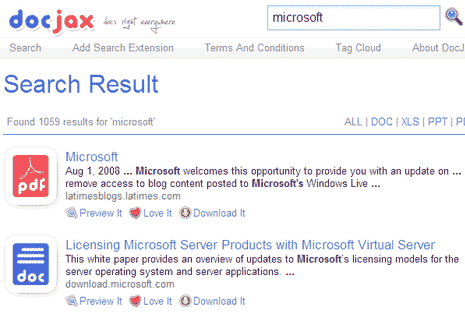 Well, tryout DocJax – a search web service for required documents all over the internet. Just enter a specific keyword and hit the search button. Results are neatly displayed indicated by document type icon among doc, PDF etc. You can also filter results based on file format, it supports PDF, XLS, DOC and PPT files formats in search results. You can preview any document listed in search results in popup inline viewer without having to lose actual search results page. Besides the preview, you can download any listed document in the search results. Right sidebar show latest tags and links to most downloaded, loved and viewed documents. Checkout DocJaxÂ and quickly download ebooks of your interest – it is easy, quick and useful!